I can’t figure out how I feel about it. My immediate reaction was to think that the saying ascribes too much intention to worrying. If nothing else, to frame worrying as a manifestation of negative outcomes is exactly the sort of formulation that would make a worrier worry more. Many worriers can’t control their “bad thoughts,” no matter how hard they try. The thoughts feel nothing at all like prayers; they feel like intrusions. Still, the remark stuck with me, and when words linger like that there’s usually a reason. While some of my worries do feel stuck to me, I know that there are others I could put down. I know that I spend a lot of time feeling fearful and anxious about things that haven’t happened, and this sometimes keeps me from appreciating the goodness of what is. I come by worrying honestly. My mom is a worrier, and her father was a worrier. He passed away before I was born, but my mother has often recounted the image of him sitting in his armchair, clutching his Greek worry beads. (I sometimes think of him when I’m counting my mala beads, which I do when I’m worried as well as when I’m meditative.) Digestive ailments, made worse by stress and tension, run in the family. It’s impossible to say whether these traits are learned or embedded in our genes, and I’m sure it’s a mixture of both. Sometimes it troubles me to think that I’m carrying on a legacy that we’d all leave behind us if we could. What I know is that I’m a little more conscious about my worrying because it’s a family affair. 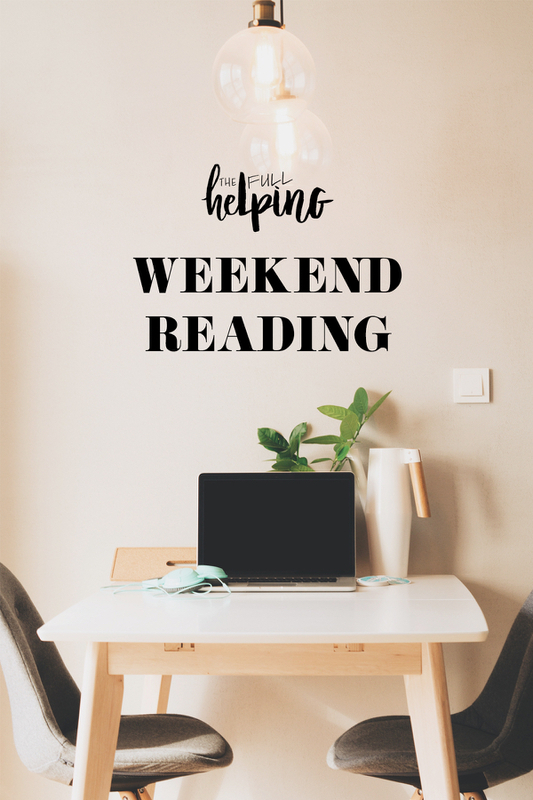 Growing up around worriers and observing the toll that worry takes on their lives has made me more equipped to examine my own worrying critically. When I’m lucky, I can catch certain patterns as they emerge and do something to lessen their impact. And it helps to have mom who is a worrier, too, because we can comfort each other, bring each other back to reality, and have a good laugh about our worries from time to time. I wanted to know what he was thinking, wanted to know exactly what it was, so that I could say, “I’m thinking that too, the very same thing, sweetie.” And he would not feel alone. And he would see that I had made it this far, had made a good life, and that whatever was in his head would not keep him from the things that he desired. But I don’t know what is in his head. No matter how much I want it to be true, we are not the same person. I love him and his brother more than anything in the world, but there are limits to what I can do to make their life happy. I have bad thoughts. Griff does too. It’s a tender recognition that Griff’s anxiety–like every other part of him–is unique. When I was young, I was often told that I came by my stomach aches and worries honestly. That may be true, but how I choose to manage them is another story. I approach my worry differently than do other members of my family, which is how it should be, since we’re different people with different needs. What matters is that we can recognize the tendencies in each other and rise up to greet them with empathy and love. After we finished reading, I walked with Griff into his own room, tucked him in, and turned out the light. I went back to my own room, my wife singing to our younger son, Patch, and I waited for Griff to call me, a bad thought in his head, and I would always, always come to him, to stand over him, for however long he needed me. Speaking of empathy, I’m also linking to an interesting article about how empathic listening can help to mitigate stress. The article describes many of the listening techniques I’m learning about in my counseling course, from the use of reflections to the importance of “feeling words.” But it presents them not only as communication skills, but also as a means of fostering mutual understanding that can help to allay stress. 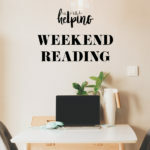 It’s definitely my experience that meaningful connection can be an antidote to the isolation of anxiety, so the article resonated. I hope you enjoy the reads. First, some tasty recipes to get things started! I love shepherd’s pie, and it’s been a while since I tried a new recipe. 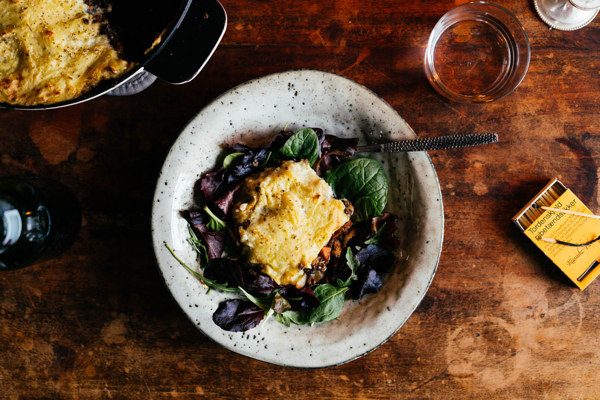 I’m really excited about Malin’s shepherd’s pie in-a-skillet, which features a hearty lentil filling and a creamy potato/cauliflower topping. 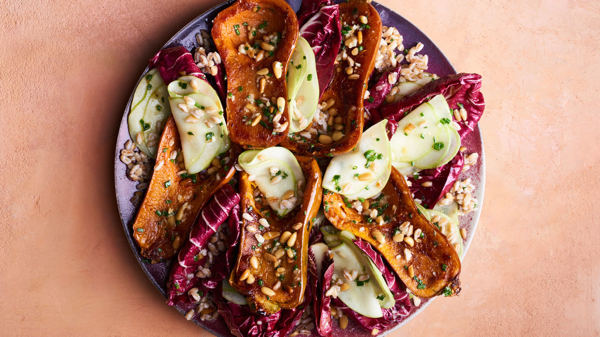 A bright, beautiful, colorful squash and farro salad from the folks at Bon Appetit. I don’t often run into honeycut squash, but I’ll grab some the next time I find them at the farmer’s market. And I’m guessing delicata squash would be a perfect substitute, too. There’s nothing like a good slice of (vegan) pizza, and I’m always on the hunt for recipes that are easy to make. 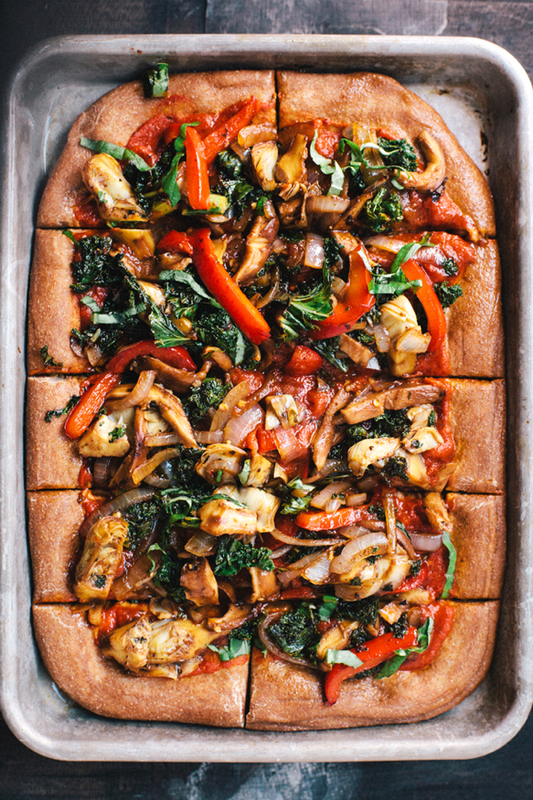 I love Haley’s cheeseless pizza, above–she roasts the veggies with balsamic before piling them on the crust, which gives them extra flavor and a touch of sweetness. It’s chili season. For me, part of the fun of making vegan chili is experimenting with different legumes as a base. 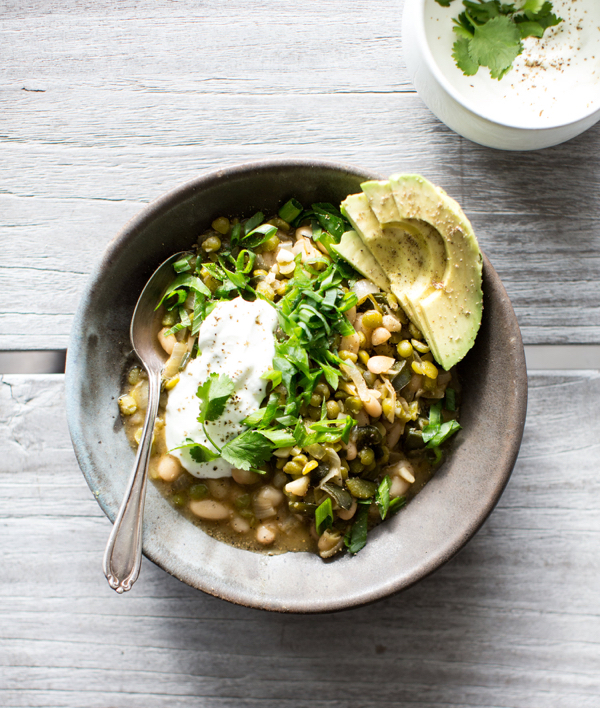 I’ve never thought to make a split pea chili, but Jodi is inspiring me with her chunky, nutritious split pea and white bean chili. Can’t wait to try it with a dollop of vegan yogurt on top. Dessert! 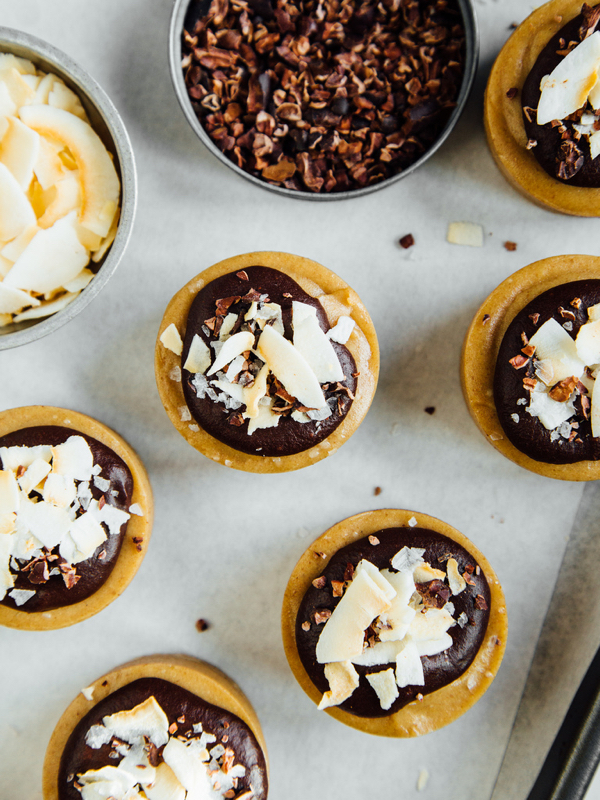 As usual, Ashlae knocks it out of the park with her vegan chocolate caramel shortbread tarts. Even the toppings (sea salt and maple ganache) have me drooling. 1. Last week, I shared Atul Gawande’s thoughts on the value of incremental health care. Gawande is a strong advocate of the power of open communication between doctors and their patients, not only because it allows information to be exchanged, but also because it can hasten healing. Danielle Ofri’s article on “the conversation placebo” follows the same thread. Ofri details a study in which a group of patients with chronic pain was divided in two; half received sham physical therapy, while the other received real PT. Real PT led to greater pain reduction, but the discrepancy was less than might be imagined (46% through real PT as opposed to 25% reduction through placebo medicine). It’s more evidence that peoples’ need to be witnessed, heard, and taken care of is a profound force in the healing process. Drugs and treatments matter, but so too does simple human attention. 2. Also on the topic of attention–this time, attentive listening–Dr. Arthur Ciaramicoli’s thoughts on the power of empathic listening as a means of releasing stress. 3. A fascinating look at the work of Maria Sibylla Merian. Merian was a 17th century Dutch woman who juggled motherhood and managing a household with a pioneering career as a botanist, naturalist, artist, and entomologist. In 1699, she said with her daughter from the Netherlands to present-day Suriname–a 5,000 mile journey–and created a remarkable artistic and descriptive treatise on the flora and fauna she observed. Her great masterwork, the “Metamorphosis Insectorum Surinamensium” has just been republished. It’s well worth checking out the book’s website and the New York Times article in order to look at Merian’s remarkable illustrations and engravings. 4. Potatoes are often regarded as an unhealthy food, in spite of their offerings of fiber, potassium, phosphorus, and iron, among other nutrients. Tamar Haspel has smart things to say about why potatoes get unfairly maligned and deserve some reconsideration. I love potatoes and other starchy plant foods, so I don’t need much encouragement to eat them. But I’ll hang on to the article for sharing with those who might be curious about welcoming more spuds into their diets. 5. Finally, Kevin Wilson’s honest and touching article about his anxiety, his son’s anxiety, and the ties that bind their stories together. Enjoy the reads, and I’ll be back soon with a new favorite, wintery grain salad. Happy Sunday. Interesting that you should post Kevin Wilson’s article. I just this morning read an article about worry and epigenetics in the current issue of Oprah Magazine, in which the author discusses how her mother’s and grandmother’s PTSD may have altered her own genetics to pre-dispose her to increased anxiety. Looking forward to reading about Mr. Wilson’s experiences. OMG THAT PT ARTICLE IS MY LIFE. There is a reason I stayed with my guy while he was an hour away and then followed him to a new hospital. And why I call him “my other intimate partner.” Today’s visit alone included laughing, crying, lots of swearing, and quite a bit of pain. We bonded over a love of good socks. He was the first PT who did a full eval and really saw me and my pain. Loyal for life (and when I can afford it will hire him for privates as well). And he listens, asks questions, pushes me when I need it, tells me to slow down when I need it, looks beyond MRI results, etc. It makes ALL the damn difference.